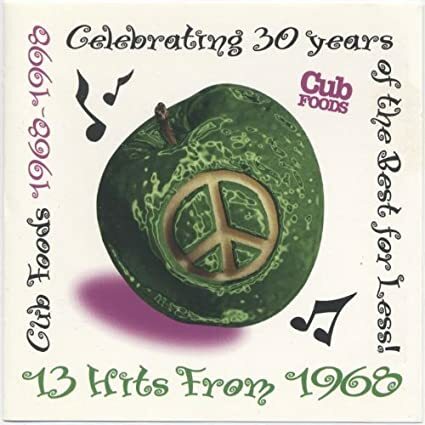 What is the best song on this collection of 1968 hits off a promo CD from my local grocery store chain ? Tough choice between Crimson and Clover and Hurdy Gurdy Man for me - voting the latter. First three pretty close for me, but "Crimson and Clover." Not Dionne's best, so I'm not voting for it. Torn between "Yummy Yummy Yummy" (my first punk record and the one that permanently polluted my brain) and "Hurdy Gurdy Man"...think I'm voting the latter. As for some of the rest: I swear I've seen Yummyx3 referred to without irony as a punk song in other places, and I can't disagree. Always thought the Canned Heat song was 2 years later. Stormy has a nice vibe to it, as do all the Classics IV hits. Midnight Confessions has a genuine aura of desperation that peeks through the programmatic music - I never thought to check if anyone's done a cover of it with more feeling than the GRs were capable of displaying. Young Girl was aptly described once (on here? by the AV Club?) as "unctuous" but I'll always associate it with an old Ralph Snart comic where he sings it in a punk band, but changes every use of 'girl' to 'maggot' before going into a guitar-smashing frenzy. A great bit of cognitive dissonance. hey, don't blame norman whitfield. he didn't start the fire. do it again. it does not sound like from 1968. it is more adventurous. like a roxy music song it is comprised of a couple of quite different parts. there is also some pretty hard blues riffing in there, quite uncommon for the beach boys. Was 'Hurdy Gurdy Man' all the way until I saw the Temps. is it the original recordings, recordings by the original artists, or the cub foods house band renditions?